The governor said 13 foreign divers and five Thai navy SEALs would manage the extraction process. Maj. Gen. Chalongchai Chaiyakam said the 13 "will continuously come out in approximately two to four days, which all may change depending on weather and water conditions," The Associated Press reported. The process is extremely risky, but officials say waters right now are at their optimal level inside the cave after a few days of better weather — and they're worried about the potential for more rains to fill the flooded caves even further. "If we keep on waiting and the rains come in the next three or four days, our readiness will decrease," Narongsak said, according to the AP. He said 13 ambulances and multiple helicopters are ready to transport the boys and their coach to hospitals. The governor has called the rescue a "war with water and time." 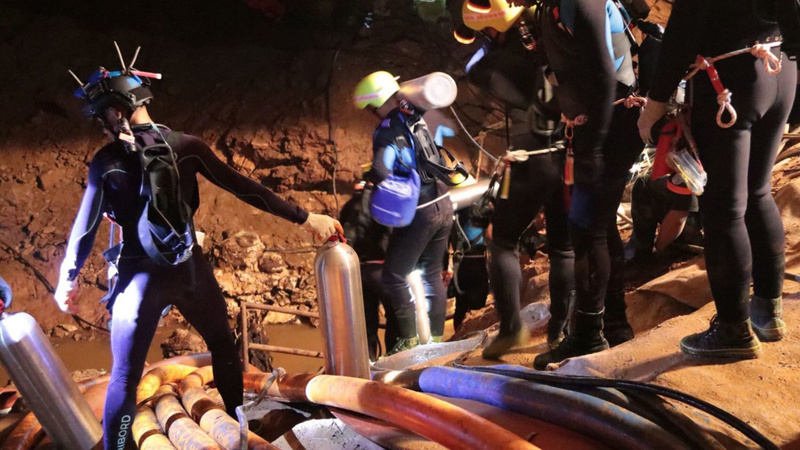 Underscoring the risk, a former Thai elite navy diver died Friday morning after losing consciousness while returning from placing oxygen canisters in the cave. Many or all of the boys do not know how to swim and none have used scuba gear before, though expert divers who have been with them in the last several days have been reportedly giving the boys instructions on diving. The boys, ages 11-16, and their 25-year-old coach have been trapped in the complex cave system since June 23 by flooded passageways. The hundreds of journalists that have been waiting outside the entrance to the cave were moved out and told to go to a different press center set up more than a mile and a half away as the rescue enters full swing. Rescuers had considered other options, like waiting months for the rainy season to end and the waters to recede. But that entails plenty of risks as well, as the water could go up before it goes down. Depleting oxygen levels in the cave have also been a cause for concern over the past week. Officials had made efforts to extend a hose to the chamber where the 13 have been holed up but have reportedly not been able to do so. The oxygen level in the cave was about 15 percent on Friday, The New York Times reported that a Thai navy commander said. Normal air contains about 21 percent oxygen. Divers have brought the boys "food, electrolyte drinks, drinking water, medicine and oxygen canisters," the AP reports.